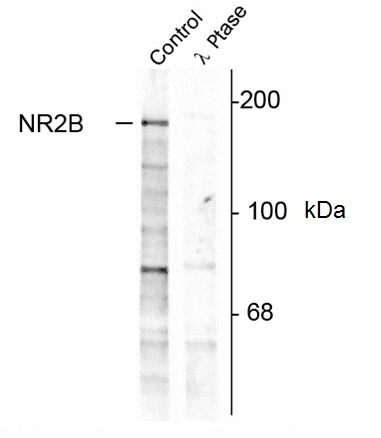 Western blot analysis of rat hippocampal lysate showing phosphospecific immunolabeling of the ~180 kDa NR2B subunit of the NMDR phosphorylated at Tyr1252 using Rabbit anti NMDA receptor antibody (pTyr1252) antibody (AHP1235). Rabbit anti Rat NMDA receptor NR2B (pTyr1252) antibody recognizes NMDA receptor NR2B, also known as glutamate receptor ionotropic, NMDA 2B (GluN2B), glutamate [NMDA] receptor subunit epsilon-2 and N-methyl D-aspartate receptor subtype 2B (NMDAR2B), when phosphorylated at tyrosine 1252. Receptors for NMDA belong to a group of ionotropic glutamate receptors which play a key role in the mediation of glutamate neurotransmission within the mammalian central nervous system (CNS), including involvement in memory and learning processes. Several antagonists and agonists of NMDA receptors (NMDAR) have been identified, including the glutamate analogue Homoquinolinic acid, which displays a higher affinity for NR2B-containing NMDAR. Properties of NMDAR include modulation by glycine, inhibition by Zn2+, voltage-dependent Mg2+ blockade and high Ca2+ permeability. The involvement of NMDAR in the CNS implicated in neurodegenerative diseases such as Alzheimer's (Popke 2003) and also epilepsy and ischemic neuronal cell death. Antisera to rat NMDAR NR2B subunit pTyr1252 were raised by repeated immunisations of rabbits with highly purified antigen. Purified IgG prepared by affinity chromatography. Phosphopeptide corresponding to smino acid residues surrounding the phosphorylated tyrosine 1252 of the NR2B subunit of rat NMDA receptor. AHP1235 detects a band/s of approximately 180kDa in rat hippocampal cell lysates. Ishii, T. et al. (1993) Molecular characterization of the family of the N-methyl-D-aspartate receptor subunits. J Biol Chem. 268 (4): 2836-43. Takasu, M.A. et al. (2002) Modulation of NMDA receptor-dependent calcium influx and gene expression through EphB receptors. Rosenblum, K. et al. (1996) Long-term potentiation increases tyrosine phosphorylation of the N-methyl-D-aspartate receptor subunit 2B in rat dentate gyrus in vivo. Proc Natl Acad Sci U S A. 93 (19): 10457-60. Popke, E.J. (2003) From anticholinesterase toxicity to Alzheimer's disease: important interactions of cholinergic and NMDA receptor systems. Toxicol Sci. 72 (2): 185-7.